Speedy Athletics centerfielder Billy Burns is your new leader in the AL Rookie of the Year race, but with a new wave of talent incoming, will he hold onto first for long? 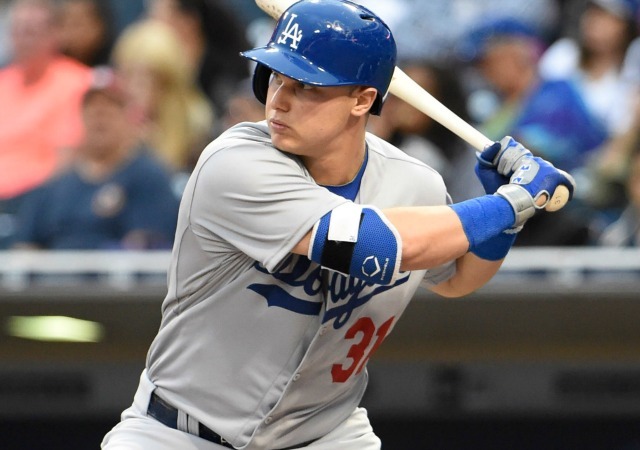 Awards Watch’s latest look at the Rookie of the Year races finds considerable upheaval in the American League, with a new leader and three new names among the five spots on my list. That rate of turnover could continue three weeks from now, as well, as the recent influx of elite prospects into the league has yet to have a significant impact on the list. As it stands, top prospects Carlos Correa, Joey Gallo, Byron Buxton, Francisco Lindor, Carlos Rodon, Chi Chi Gonzalez and Vincent Velasquez are still on the outside looking in, largely due to insufficient playing time. Indeed, Correa, Gallo and Gonzalez would seem to be locks for this list if they are able to maintain their current levels of production for another three weeks. There is new talent in the National League, as well, with the Phillies' Maikel Franco and the Mets' Noah Syndergaard the most likely to force their way onto the list next time around. But the NL list, as you’ll see below, is much stronger to begin with and could prove more difficult to crack for the league's late arrivals. Note: All stats are through Wednesday, June 17. League leaders are in bold, major league leaders in bold and italics. The number in parentheses after a player's name reflects his rank on the previous list. Rookies are players who, prior to the current season, had fewer than 130 at-bats or 50 innings pitched in the majors or spent fewer than 45 days on the active roster prior to rosters expanding on Sept. 1. As Oakland’s leadoff man in 30 of the team's last 31 contests, the 25-year-old switch-hitter has posted a .371 on-base percentage and reached base in 28 of those games. Meanwhile, among AL rookies, only Rays rightfielder Steven Souza Jr. has had more plate appearances this season, and Souza’s .222 batting average and lousy play in the field continue to keep him off this list entirely. Despite having now spent a full month on the disabled list due to shoulder inflammation, Travis is still sixth among AL rookies in place appearances, and his production while healthy has kept him near the top of this list. Having begun a rehab assignment on Monday, Travis is believed to be close to returning to the Blue Jays. It will be interesting to see if the 24-year-old can recapture his April form once he does, as his bat had gone cold in May before his injury. The 29-year-old Butler is on his third organization in three years, having appeared in eight major league games with the Rangers in 2013 and six with the Cardinals last year. Signed to a minor-league deal in January, Butler—an outfielder and career .294/.379/.446 hitter in the minor leagues—hit well enough in Triple A Durham to get the call when Desmond Jennings hit the disabled list in early May. Since then, Butler has emerged as the Rays’ everyday designated hitter, putting up impressive numbers. With Jennings out until August due to knee surgery, Butler should stay in the lineup as long as he remains productive, though as a designated hitter, he could have difficulty competing for this award against more multi-dimensional players. ​McCullers has made just six major league starts, but he has thrown more innings (36) than any rookie reliever in either league and has arguably pitched better than any other rookie starter this season regardless of playing time—certainly better than any other rookie starter with more playing time. McCullers has allowed as many as three runs in just one of his six starts, doing so two turns ago in a seven-inning outing in which he struck out seven men against no walks. In his start before that, he went the distance against the Orioles, holding Baltimore to one run on four hits and striking out 11 against no walks. In his last start, he held the Mariners hitless for five innings only to get the hook because he was at 90 pitches (due in part to a season-high four walks) and had an 11-run lead. Beyond the numbers, McCullers is just a thrill to watch pitch, pumping fastballs up to 98 miles per hour, then dropping a nasty curve or changeup. He’s new to this list this week, but I don’t expect him to fall back off any time soon. ​Karns edges Rangers leftfielder Delino DeShields’s comparably competent mediocrity and Texas starter Chi Chi Gonzalez's small-sample success by virtue of having spent the entire season in the Rays' rotation and delivering solid, slightly above-average results. A 27-year-old acquired from the Nationals in minor deal prior to last season, Karns is nothing special, but he had an outstanding May, posting a 1.88 ERA in five starts and striking out 28 men in 28 2/3 innings. He deserves some recognition for that performance, but he’s ultimately a placeholder here, likely to be knocked out by that bumper crop of elite prospects three weeks from now. Pederson has hit just .184 in 12 games since his streak of five straight games with a home run came to an end earlier this month, but over those same dozen games he has reached base at a .380 clip. Combine that with his fine play in center, of which the below is a mere sampling, and Pederson has remained tremendously valuable despite his hitting slump. That’s a testament to his broad range of skills, and it suggests that he will be difficult to knock out of this top spot. Bryant has an active 13-game hitting streak and has gone 9-for-23 (.391) in his last five games, but his home run in the Cubs’ 17–0 win over Cleveland on Wednesday night was his first in 18 games, and his next multi-home run game will be his first in the major leagues. Bryant is still slugging .507 despite failing to deliver a barrage of home runs comparable to the one he let loose in the minors, but his somewhat underwhelming power performance and sub-par play at third base are preventing him from being a real threat to Pederson. Kang’s bat went cold almost immediately after I last checked in on the Rookie of the Year races, but he’s warmed back up of late, going 8-for-22 (.364) with a couple extra base hits and a .481 on-base percentage over the Pirates' last seven games. That was enough for him to hold on to his spot here, though his place is more tentative than it was three weeks ago.